There isn’t a single person in BC who is unaware of the forest fires plaguing the province this summer. For some of you, it’s a general concern that has your heart going out to wildlife and residents impacted by the devastation, for others who have to navigate the highways of BC for the remainder of the season, it’s a major safety concern. Park Insurance has provided guides to keeping homes and businesses safe from seasonal wildfires, while also asking you all to help prevent them from occurring, but today we touch on the immediate threat for those of you who find yourself on the road when forest fires are near. The most obvious solution is the most effective. If your destination demands that you drive on the impacted highways this season, change your plans if at all possible. That may mean putting off your weekend vacation to the Okanagan, but it’s better safe than sorry. For those of you that have no choice (i.e. you’re leaving the area for your own household’s safety) consider alternative forms of transportation. Last year, major airlines offered discounts on flights out of fire-stricken communities in BC, so contact your preferred airlines to see if they are offering the same. 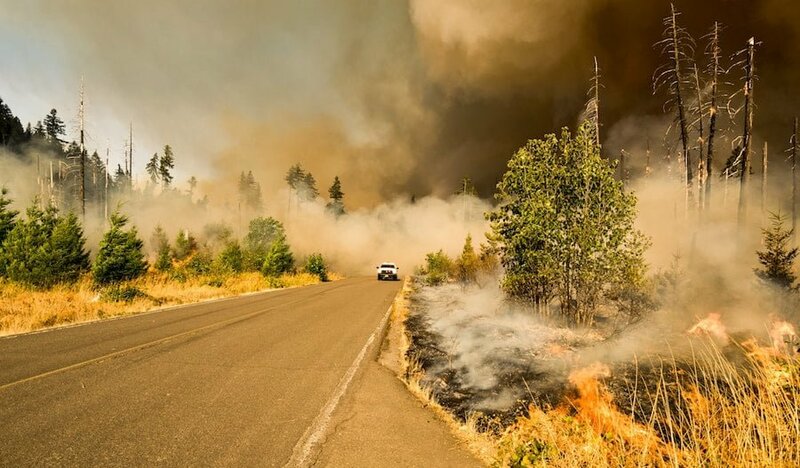 If you must drive on BC highways during the summer forest fire season, pay VERY close attention to the most up to date road closures and warnings. What applies hours before a trip can change with the wind as a new gust can send a wildfire in another direction. While there may not always be options, do your best to choose the safest ones when viable, even if it adds a couple of hours to your total travel time. For example, if you’re driving from Vancouver to Penticton, you may need to swap the Coquihalla for Allison Pass, considering the proximity of recent forest fires that have crept up to the connecter from Westbank through Peachland and further southwest. BC Wildfire Services (BCWS) has provided this real time map of active wildfires in the province that you will need to reference around the clock. During your pits stops (refueling, etc.) remember to check the map in case there is reason to turn around and change your course. In addition, follow developments on the BCWS Wildfires of Note and Fire Danger web resources, the latter of which notes how easily fires can start and spread in a given area, indicating which areas are at risk of severe wildfire activity. Lastly, if you see smoke on the near horizon and the road behind you is without, you may choose to abandon your trip and return to where you came from. Whatever pressing matter had you heading out on the highway in the first place may be better postponed. A/C and your car cabin will be your best friend when driving through impacted areas. Even when the skies look relatively clear, open windows can have you breathing in toxic smoke-filled air that can negatively impact your respiratory health, incite coughing, and cause drowsiness. Keep the windows shut tight, close all exterior air vents, and set your air-conditioning to recirculation mode. Resist the urge to “beat” the poor driving conditions caused by nearby forest fires by speeding through to your destination. Instead, drive calmly, defensively and with caution. Given that visibility will be reduced, keep the headlights and hazards lights on and watch the road for others who may have pulled over on the shoulder, in addition to wildlife that may be fleeing the mountainside. When visibility becomes severely impacted, honk your horn when driving around bends and to alert approaching vehicles and animals. If you pull over for a pit stop, consider the ever-present risk that your car may not start right away or at all. You want to make sure the vehicle is not parked in a fire-risk zone. Avoid pulling over near debris, brush, grass, trees, branches or any other combustible, and instead stop near a river, stream, clearing, rocky area, or roadway with plenty of concrete. Smartphone charger to connect to the car so that you can call emergency services if need be. Fire retardant blanket for each passenger. Extra bottled water (12-24 bottle case, contingent upon distance travelled). Remove unnecessary flammables such as gas and oil cans, synthetic fabrics, and anything that you don’t absolutely need. If you’re concerned about having adequate automobile insurance to cover you for all that can occur when driving during forest fire season in BC, contact Park Insurance right away.